Students visited the monasteries of Meteora as part of their heritage program. 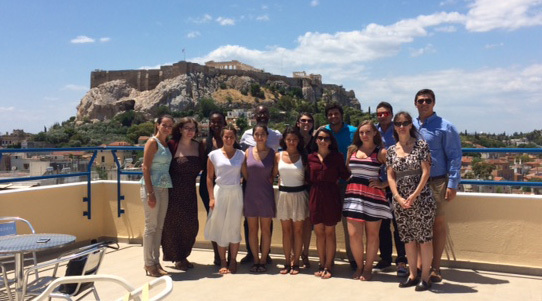 This summer, Webster University Athens welcomed students from across the U.S. and Canada to the unique heritage program, Journey to Greece. The program is sponsored through AHEPA (American Hellenic Education and Progressive Association) and this year full scholarships were provided for the students from the Stavros Niarchos Foundation. AHEPA and Webster Athens have a long standing relationship and provide a unique opportunity for students of Hellenic descent to discover their roots in the birthplace of their ancestors. 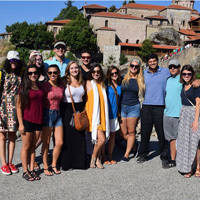 Students spend a month studying the Greek language and Greek culture and society, while they travel around Greece during the program excursions. Aside from their class work, the students were busy visiting sites around Athens and learning first -hand about Greek culture and society. The students traveled to northern Greece and visited the archaeological sites of Delphi, Dion, Vergina (tomb of King Phillip, father of Alexander the Great), Ancient Pella (birthplace of Alexander the Great), in addition to visiting the monasteries of Meteora and the cities of Thessaloniki, Edessa and Veria (the monument/shrine to Saint Paul the Apostle at the place thought to be Veria's Vima, on the western side of the city, where he preached Christianity around 49-51 A.D.), and Naoussa (school of Aristotle). They also visited the islands of Aegina, Hydra and Poros and the Temple of Poseidon in Cape Sounio. Webster Athens rooftop, with its breathtaking view of the Acropolis in the background. In addition to the excursions and site visits around Athens, the students also visited the Hellenic Parliament building to learn about the political system in Greece and how it functions and operates. They had the opportunity to witness the parliament in session and afterwards had a briefing at the Webster Athens campus of what they observed. They also visited the Ministry of Foreign Affairs and learned about Greece and United States relations, in addition to current events. The First Secretary, Political Section of the United States Embassy in Greece spoke to the students about U.S.-Greece relations and what services the U.S. Embassy provides to American citizens who are abroad. The students were interactive in all the visits and asked several questions. All students of Hellenic descent may participate. For information on next summer’s program, please check the AHEPA Journey to Greece website, www.ahepa.org.